Dog bathing can be a tricky and frustrating business. Not to mention messy! Not all dogs actually hate the bath itself – it’s more that they hate the restraining that comes with it. Other dogs may have had bad experiences with the bath when they were a puppy. And others may just not like the feel of the water on them. Or the soap or strange noises of the water running down the plug. If your dog doesn’t like having a bath you’ll find they’ll often squirm, shiver and shake as you try to bathe them. They’ll do anything to try and avoid getting washed or to get out of the bath. If you’re not careful, your dog may make a run for it, trailing soap suds through the house. On the plus side, most dogs will only need bathing once a month. But you may need to bathe your dog more often if they’re particularly dirty. Or if they’ve been rolling around in some foul smelling thing, like dogs like to do if you let them. That said, no matter how often you’re going to be bathing your dog you should make it as enjoyable as possible. This will make it easier for you and more enjoyable for your dog. And that will lead to less frustration and fear, and a better relationship between you both. Start by giving your dog a good brushing. Remove any matting and knots from the fur. Stand your dog in the bath and hold them by the collar. Pour a jug of warm water over their coat. Make sure the water is warm and not hot or cold. A good tip is to put a rubber shower mat down so your dog doesn’t slip. Pour on the dog shampoo and rub the coat, working up a lather over the entire body, except the head. Take special care not to get any water or soap in your dog’s eyes. Pour shampoo into your hands and work it into lather. Then use this to wash your dog’s head. Once more, take special care not to get any in your dog’s eyes or mouth. 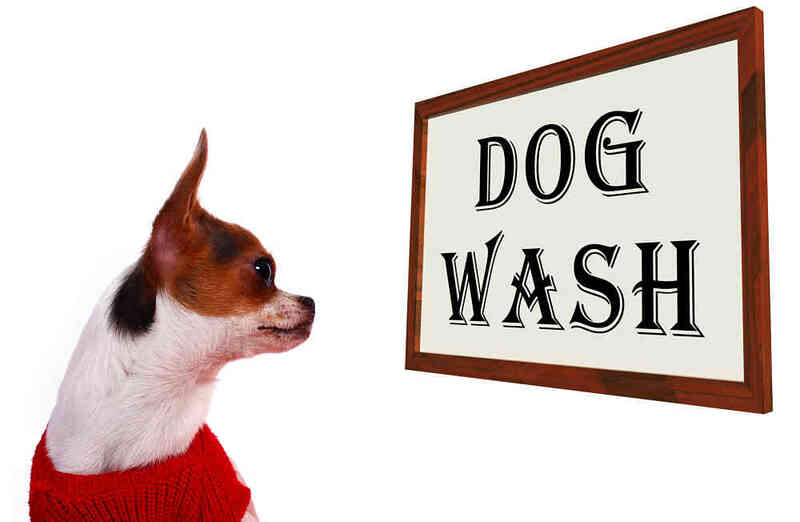 Rinse the soap from your dog’s head and then dry it with a towel. You should dry the head before rinsing the rest of the body. Next, use warm water to rinse the rest of the body. Make sure all the shampoo is completely washed off. You can apply and rinse off a conditioner at this stage, if you wish. If your dog has a long coat, use your hands to squeeze any excess water from it. Lift your dog out of the bath and dry it with a towel as much as possible. Dogs often get excited after coming out of the bath, especially when the hair dryer is on. It’s important you don’t let your dog outside until they’ve calmed down. If you do, they’re likely to roll in the smelliest thing they can find to mask their smell. Then you’ll have to bathe your dog all over again! Follow these steps once a month to make sure your dog always looks their best. Regular dog bathing also has the added benefit of controlling external parasites. Plus it gives you an opportunity to check for any skin problems. This alone makes regular dog bathing a worthwhile exercise.